1. Wassail, Wassail all over the town! So be my good fellows all -- I'll drink to thee. Come, fill it up now unto the brim. And then you shall hear our jolly Wassail. I hope your soul in Heaven will rest. Then down shall go butler, bowl, and all. Note: verse 2 does not appear in the Husk version, but appears in others. 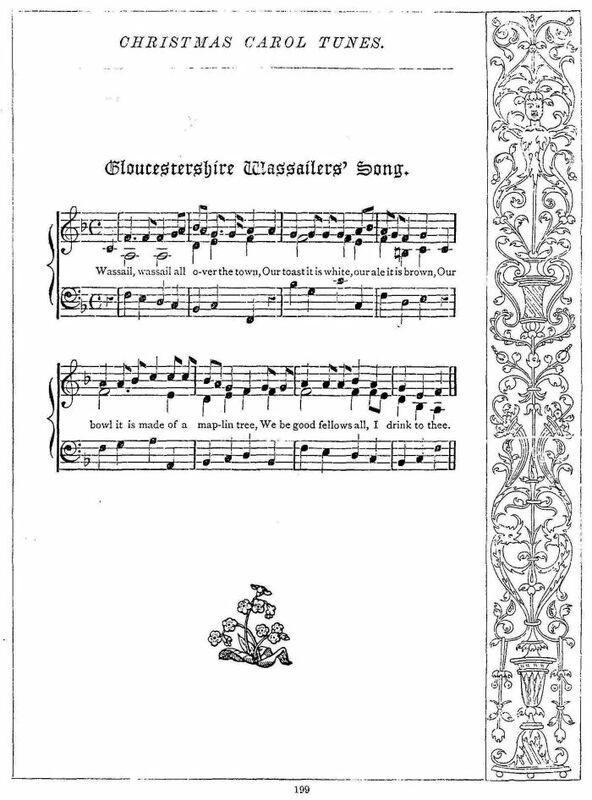 This carol was seventy years since communicated by Sameul Lysons to Brand, withthe information that it was then still sung in Gloucestershire, and that the wassailers brought with them a great bowl dressed up with garlands and ribbon. The names of the horse, mare, and cow in this copy -- Dobbin, Smiler, and Fillpaid -- are left blank in Brand's copy, to be supplied by the singers as circumstances required. Persons still living remember the Wassailers singing this carol from house to house in some of the villages by the Severn side below Gloucester, nearly fifty years since, and the custom has been uninterruptedly maintained and still subsists in the western parts of the county. On New Year's Eve, December 31st, 1864, the carol was sung in the little village of Over, near Gloucester, by a troop of Wassailers from the neighbouring village of Minsterworth.